1,000T/D soybean oil refinery line built by Myande for Shandong Sanwei was launched successfully. All technical parameters of the refined oil are better than national standards. Management team of Sanwei Group gives a high comment of Myande engineers’ work ethics shown during the construction period, the quality of all the equipment, process design, layout planning, intelligent control and all other aspects of Myande. Shandong Sanwei Group Co., Ltd., founded in 1988, is a comprehensive enterprise specializing in processing soybean oil, soybean meal, soybean protein, and health food products. It combines production, research and development, sales. Shandong Sanwei Group Co., Ltd. was named high-tech enterprises in Shandong Province in 2002. In addition, it has been listed among the leading enterprises of advanced agricultural industrialization for five consecutive years. The cooperation between Sanwei and Myande has not only accelerated the pace of strategic development of Sanwei Group Co., Ltd., but also made Myande oils and fats engineering services more widely recognized by all sectors of society. During pre-commissioning, Myande engineers carefully checked each equipment item and pipeline to ensure there is no security risks. At the commissioning stage, they carry out operation and maintenance of the process in strict accordance with clear-defined procedures to ensure accuracy during commissioning. Through overall planning by project manager, all engineers from Myande and staff from Sanwei Group were devoted to commissioning work to ensure efficient production processes and stable operation, thus creating a miracle of getting a one-time success of commissioning the large oil refinery project. 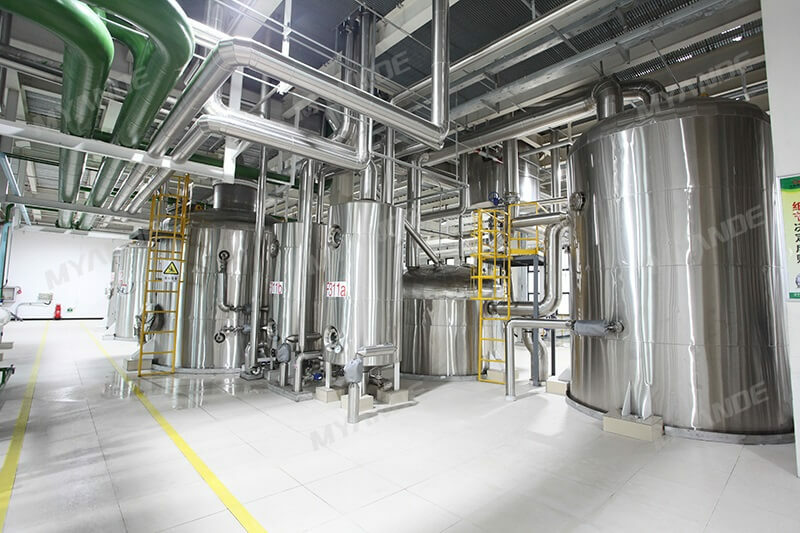 Myande’s combined deodorization tower, which is independently developed by Myande R&D center, has been successfully used in several refinery projects. The success of Shandong Sanwei project once again highlights its "power". With rich experience accumulated through numerous soybean oil refinery projects, this 1,000 T/D soybean oil refinery line designed by Myande boasts desirable features including reduced energy consumption, intelligent control, environmental-friendliness and reliable product quality. Myande has cultivated a professional engineering team consisting of research and development, design, procurement, manufacturing, quality control, installation, commissioning and after-sales service system. Advanced manufacturing methods and strict quality control system can provide customers with more secure, reliable and energy-efficient mechanical products and engineering service. From process design, equipment manufacturing to installation and commissioning, Myande staff makes all efforts to ensure 100% qualified products and successful operation with strict work attitude and meticulous professional standards. One-time commissioning success of this project just well reflects “Fine for Safety” which is the enterprise spirit of Myande. In addition, this is re-affirmation for Myande team system.